Thank u so much For your like everyone. Please do comment and let me know how this shot was. A girl is seen screaming at a boy. Girl: give that back to me .. Boy: who asked you to get married today? Girl: don’t spoil my mood give that bangle back. Boy: there is no chances of me giving it back to you. Girl: give it back or else i’ll break every single bone in your body. So give it back to me right now. Boy: It will be a pleasure to get my bones broken by you. The boy is revealed as Laksh Maheshwari. Girl: laksh..give it back to me.. Girl makes a sad face. Laksh: what happened Preethi? Gave up huh. 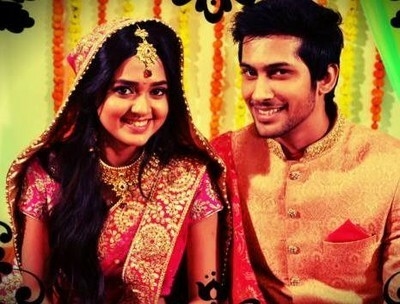 The girl is revealed as Preethi Laksh’s childhood friend and his bhabhi’s younger sister. Preethi: its my wedding and i don’t want to mess with you. Laksh: do all type of emotional drama still you are not going to get this. Preethi: Then go ..take that bangle with you i don’t want to have it anymore. And because of your this behaviour people leave you laksh that is why she left. Preethi realises what she said. Priya(laksh’s bhabhi and Preethi’s sister) sees this. Priya: Laksh don’t go listen to me she was..
Laksh: its ok bhabhi..i am not at all affected by it see i am smiling. Priya: what is this Preethi? Preethi: di i am really very sorry i didn’t mean to say that. Priya: Preethi you are his best friend you know what he has gone through. Still why are you doing this to him? Preethi: di i said na i really didn’t want to say that it slipped from my mouth. After some time Laksh is sitting inside a room and trying everything to stop is tears. Laksh: haan bhai..is there anything you want? Luv(Laksh’s elder brother): yes..your happiness. Laksh: bhai what you want from me then? Laksh: ask for something that i am give bhai…me and happiness we just broke up..just like me and her. Laksh: no…bhai don’t call me that. Its Laksh…not anything else. Laksh angrily leaves the room. Luv: please Laksh..we cant see you like this broken breathing just for the sake of living. We want you back Lucky we want you back. And we are never going to forgive her ..never ever. If you enjoyed this update then pls like and comment.